“Escape From Riverdale”—This is how the end of the world begins… Harvey Award-winning writer Roberto Aguirre-Sacasa (Stephen King’s The Stand, Archie meets Glee) and Eisner-winning artist Francesco Francavilla (The Black Beetle, Guardians of the Galaxy) take Archie and the gang where they’ve never been before—to the grave and back! A horrific accident sets off a series of grim events and Sabrina the Teenage Witch must try to repair the unspeakable evil her spell has unleashed. 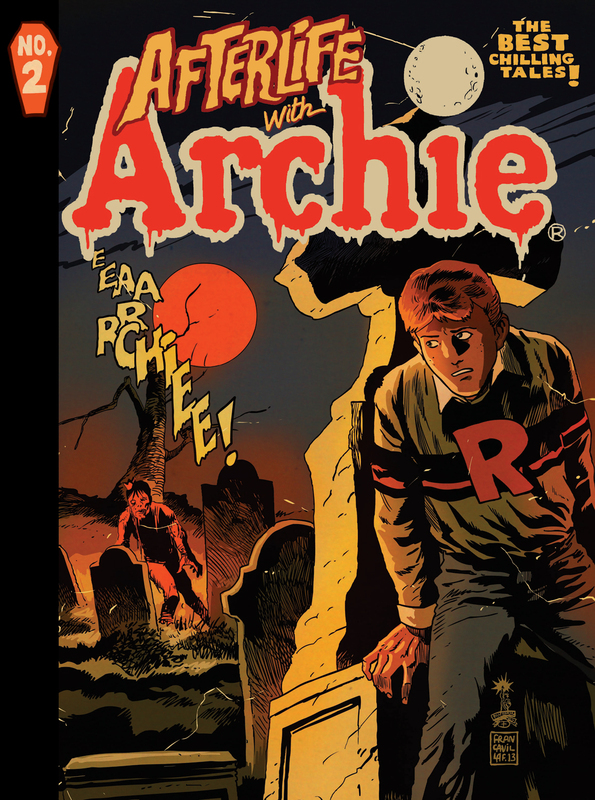 Gasp in horror as Riverdale faces an impending zombie Arch-pocalypse in the first issue of the magazine-size edition of the hugely successful, award-winning AFTERLIFE WITH ARCHIE series, featuring all new special features. For TEEN+ readers. The end of the world is here… The horror continues as a zombified Jughead goes on a relentless hunt for brains in this shocking series by Harvey Award-winning comic/screenwriter Roberto Aguirre-Sacasa (Stephen King’s Carrie, Archie meets Glee) and Eisner-winning artist Francesco Francavilla (Batman, Black Beetle). 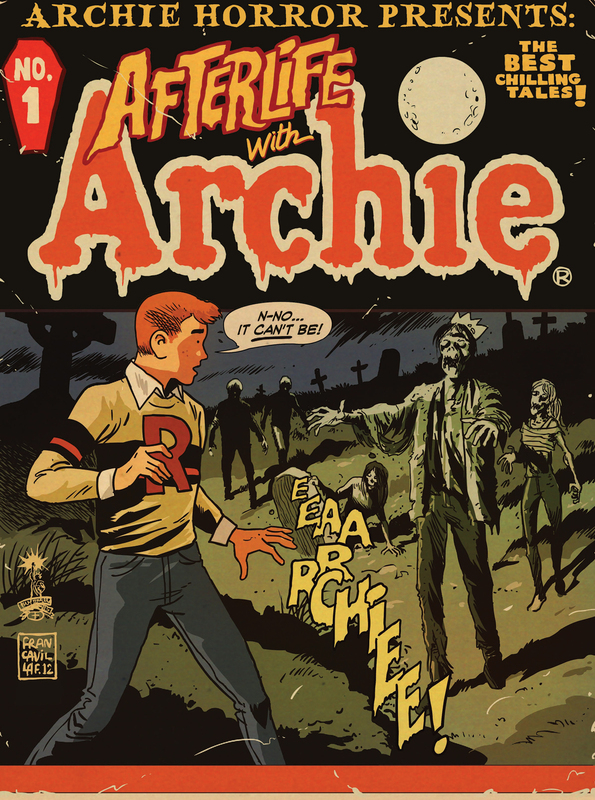 When he performs a despicable and frightening act in front of everyone at the Halloween dance, tensions start to rise and fears begin to mount—who will be next to join Jughead in the Afterlife? And what about those who are already infected? Be warned, kiddies, this one’s not for the faint of heart! This magazine-size edition of the award-winning AFTERLIFE WITH ARCHIE features sorcery stories from the vault, a very special preview of the upcoming Sabrina series and all-new extra features. For TEEN+ readers. Harvey Award-winning writer Roberto Aguirre-Sacasa and artist Robert Hack bring this dark re-imagining of Sabrina the Teenage Witch’s occult origin to spine-tingling life. “A Ghost Story.” Contrary to popular belief, the current zombie outbreak is not the first time a shadow fell across Riverdale and its citizens. As the survivors hunker down in a hotel to wait out a snowstorm, Hiram Lodge and Mary Andrews relive the darkest chapter of their town’s history. Ten years ago, the adults of Riverdale struck a terrible bargain with the witches of Greendale, setting the stage for the present-day apocalypse. There are some things in this world that mortal eyes should never witness — that’s a lesson poor Harvey Kinkle will learn the hard way, when he makes the unfortunate mistake of intruding on the darkest of ceremonies — an offense that the witches’ coven takes very seriously. Though Harvey’s life hangs in the balance, it is the Spellman family that will come face-to-face with true evil. Indeed, the choices made by teen-witch-in-training Sabrina on this dread night will determine the fate of every living soul in Greendale. Follow Afterlife With Archie on Facebook and Twitter for ongoing updates.